By: Andreas J. Kostenberger & Terry L. Wilder, eds. In Entrusted with the Gospel, Andreas Kostenberger, edits a book of essays, that examines and explores historical scholarship on 1 & 2 Timothy and Titus. 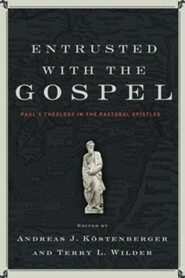 In their work, much clarification and insight is brought to Paul's controversial theology in these epistles, and several important hermeneutical and exegetical challenges are also highlighted and discussed, including authorship, genre, historical background, and issues surrounding church leadership. See Table of Content for a list of contributors. This book will serve well any exegesis course on the Pastorals, familiarizing students with the major issues involved, without overwhelming them or while developing their thinking along evangelical lines. The book will also make an excellent supplementary volume for NT Theology courses, or a great read for small groups and/or church study. After a lengthy period during which scholars paid relatively little attention to the Pastoral Epistles, a spate of studies has suddenly appeared in print. However, except for a small number of commentaries, critical scholars have by and large neglected evangelical scholarship on these letters. To fill in this gap, this volume offers a collection of important essays written by evangelicals on 1 & 2 Timothy and Titus. The book aims to inform readers of the history of scholarship on these letters and examine thoroughly Paul’s theology in the Pastoral Epistles. Contributors include several scholars who have done previous advanced work on these letters: I. Howard Marshall (University of Aberdeen, Scotland; Recent Study in the Pastoral Epistles), Andreas Köstenberger (Southeastern Baptist Theological Seminary[SEBTS]; Hermeneutical and Exegetical Challenges), Terry L. Wilder (B&H Publishing Group; Authorship), F. Alan Tomlinson (Midwestern Baptist Theological Seminary [MBTS]; Purpose/Stewardship), Greg Couser (Cedarville University; Doctrine of God), Daniel L. Akin (SEBTS; Christology), Ray van Neste (Union University; Cohesion and Structure of the PE), B. Paul Wolfe (Southwestern Baptist Theological Seminary; Use of Scripture), Ben Merkle (SEBTS; Ecclesiology), George Wieland (Carey Baptist College, New Zealand; Soteriology), Thor Madsen (MBTS; Ethics), and Chiao Ek Ho (East Asia School of Theology, Singapore; Missiology). Andreas J. Köstenberger (Ph.D., Trinity Evangelical Divinity School) is senior research professor of New Testament and Biblical Theology at Southeastern Baptist Theological Seminary. I'm the author/artist and I want to review Entrusted with the Gospel - eBook.